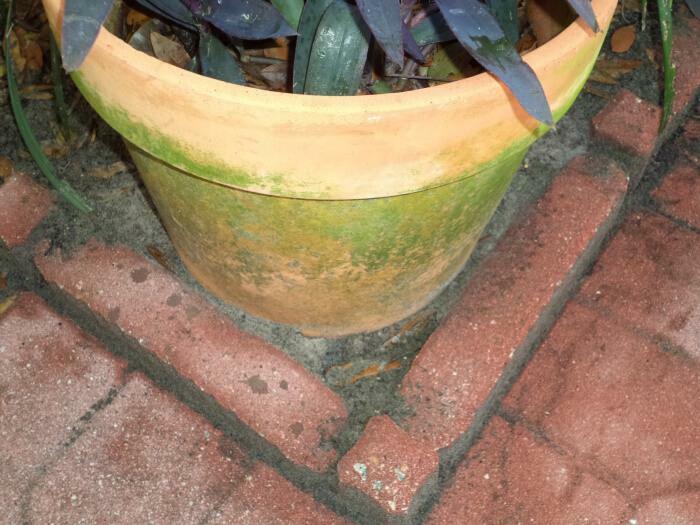 I am completely amazed at the wonders that the Endurance BioBarrier products have done on various areas that I tested around my Florida home (see before and after photos below). I truly appreciate the fact that these products are safe for people, pets and plants as well. Run, don’t walk to the Endurance BioBarrier website today to get your products to remove that mold and mildew from your home. 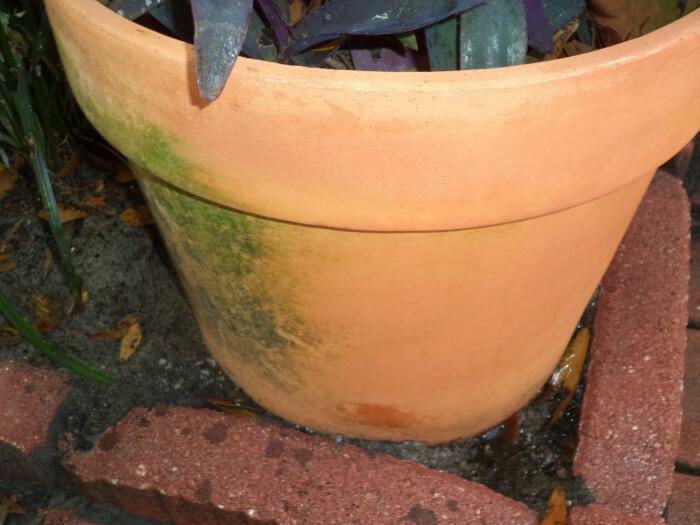 Unsightly mold or algae on terra cotta flower pots. A common problem in Florida and any high humidity environment. Wow. What a difference. Only very little scrubbing on a small test area with Endurance BioBarrier Mold & Grime Cleaner Prep. Followed by the Mold Prevention Spray. Click to enlarge. Shower grout doesn’t look too bad in this “before” photo. But what a surprise in the “after” photo! 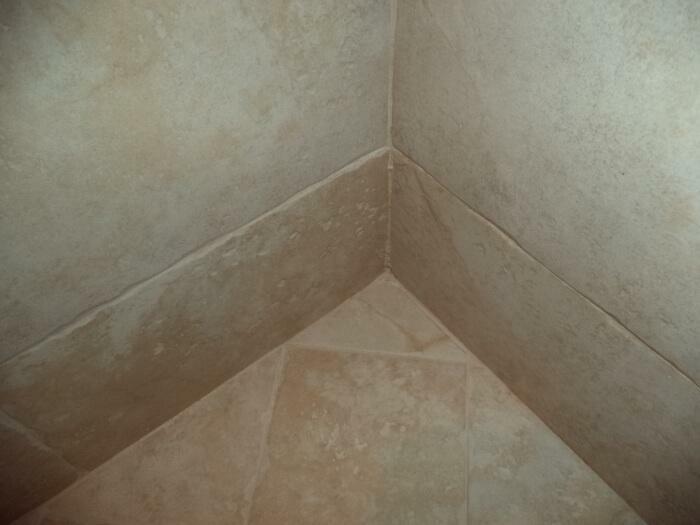 You don’t realize how unsightly your grout can look even with only a little mold. Click to enlarge this “after” photo. You’ll see a huge improvement after using Endurance BioBarrier Mold & Grime Cleaner followed by their Mold Prevention Spray. Looks like brand new grout. My ugly harvest gold tile shower is the ugliest spot in our home. And its attractive color is not helped by the mold growth that returns like clockwork every three weeks. I have tried everything to control its regrowth. I used bleach, I leave the shower door open all day. I even replaced the caulk in this shower. But every three weeks that mold peeks out from the cracks and crevices. This bathroom is slated to be demolished at some point, but until then it needs constant cleaning. That is until a few months ago when I tried Endurance BioBarrier Mold Prevention Spray. I didn’t want to blog about the Cleaner Prep and Prevention products until I had tried them for more than a few months. I’m happy to report that for four months, I didn’t need to clean our shower! 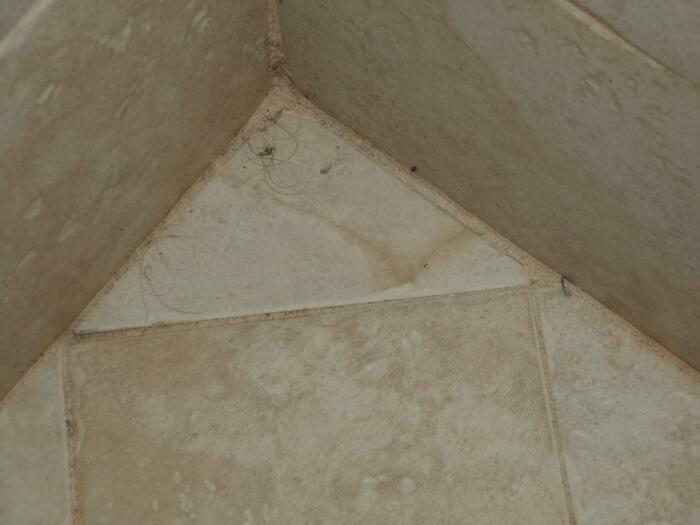 Normally after three weeks the mold and mildew would have been happily growing in the corners of my shower. I am really excited to tell you guys that Endurance BioBarrier Cleaner Prep works! Not only does it get the icky film off our bathroom sinks and bring back their shine, but it also effectively cleans the build-up in our showers and baths too. Something else I appreciate is that their cleaner has zero odor! That’s right – no harmful fumes that irritate your eyes or make you dizzy with Endurance BioBarrier. After using the Cleaning Prep, I then sprayed the Mold Prevention Spray around the tub and sink areas. I’m currently testing out the results and will follow up in a few months to let you know if the mold prevention is holding strong, so stay tuned! In my previous post I shared how I used the 2-step system. I then left the bathroom as-is for 3 months, and now the results are in! The bathroom has not been cleaned since, and it still looks fantastic! No mold or mildew stains from 3 months of showers and zero cleaning. I sprayed [Endurance BioBarrier Mold & Grime Cleaner Prep] on the window and then went and did a bit of laundry. Then when I was done I was ready to wipe it off. I wet a rag with a bit of water so it was damp and then wiped off the window ledge. The mildew came off in the first swipe and didn’t leave a residue. It also made them look so clean and white. Step two is key to guarantee long-lasting protection from regrowth of mold and mildew. I don’t want to have to be doing this every week. I sprayed down the surface with Endurance BioBarrier Mold Prevention Spray. Just one application will protect you through 100’s of wet-dry cycles. That’s great news because, like I mentioned, you don’t want to have to be doing this every week! Pretty impressive stuff. Do you have mold growing in your house? It’s commonly found around windows, in showers, in tile grout, around kitchen sinks, on outdoor patio furniture, and countless other places! Endurance BioBarrier is a safe way to get rid of it AND prevent it from coming back! 5 Stars (Amazon Verified Purchaser) The products worked BEAUTIFULLY!! After much searching and researching, I found this product on the web and contacted the company with several questions as to its use and safety. Last spring (2014) I sustained flooding in my basement family room which has w/w carpeting that I wanted to salvage, if possible. I used the EBB Cleaner Prep to clean and destroy mold on the carpet and applied the EBB Mold Prevention once the carpet dried. The products worked BEAUTIFULLY!! There was no lingering odor; the carpet was restored to its prior condition without any discoloration, and dried within hours. There have been no adverse affects to pets, children, adults, plants; and there has been no mold growth in the months since application. I worked over 30 years in apartment management, real estate appraisal and brokerage, and highly recommend this product on a consumer and professional level. I also continue to use the Cleaner Prep for general purpose cleaning. Great products! I want to let you know how pleased we are with Endurance BioBarrier mould treatment and prevention. We have a two bedroom apartment in Marbella, Spain that we rent out for holidays. It is in the Old Town where the streets are narrow to shut out the sun, and the walls have no cavity or insulation. As well as this the guests do not open the windows, and they dry clothes indoors. We had a terrible problem every winter with mould on all the outside walls and on the curtains hanging against these walls. I tried various things with no success, and in my searches on the internet for a solution I came across your product. At the end of last summer (2014) we cleaned all the affected walls and ceilings with the cleaning liquid, then repainted and finally applied a thin coat of the protector. We also wiped the curtains down with the cleaner and sprayed them with the protector. I am very happy to say that in all the winter months we have not had any problem either on the walls and ceilings or on the curtains. We are absolutely delighted. 5 Stars (Amazon Verified Purchaser) So Far So Good! I wiped off mold with a damp vinegar cloth, let dry, and applied Endurance BioBarrier then let it dry. It has been a few months and so far, mold free. This is the longest period of “mold free” for my problem areas that I have ever seen. This stuff seems to work and I will definitely re-order. A friend offered to show me your new mold removal product which he was excited about. I said, “Let’s try it on that mold in the tub that has been there for years.” I was amazed! The EBB Cleaner Prep ate through and removed the 1/16 inch thick black mold.The Endurance BioBarrier mold prevention has also worked great. I was really surprised and shocked 3 months later when the place where the mold had been, actually appeared to continue getting even cleaner and whiter! Thank you for the opportunity to use your great products and for getting rid of that nasty mold. As you know we live on our boat but take long trips away from the boat when we are in various countries. When we met you at West Marine near Bristol, RI we were completely overhauling the boat. When we spoke with you about the Endurance Bio-Barrier you said it would completely eliminate mold and musty odors. So we took your advice and lightly sprayed every inch of our boat including the seat cushions and anchor locker. Fast forward almost five years there is still no odors of any kind and we took several multi-month trips away from the boat in all kinds of heat and moisture. When we arrived back at the boat and opened the hatch, nothing. No mold, no smells, nothing. We have not refreshed any part except for the anchor locker as it gets a lot of use. The product has worked better than we could have imagined. So kudos to you and your company for making such a good product. Thanks. I wanted to thank you for introducing me to the Endurance Bio-Barrier. We have tried the product in many different restoration situations and found it to be extremely beneficial as a malodor preventative and as an anti-microbial during the structural drying process. I have found it to be far superior then some of the well known brands out there. We utilized this product in two main situations. We had an old fish market which had a malodor issue. All the standard commercial antimicrobial products had been used with no long term success. The current products would work but the smell had a tendency to reappear after a week or so. My customer needed a more cost productive approach. Endurance was applied and has successfully eliminated the malodor in the space. We had a vacancy which suffered water damage. There was no electricity and no way to provide appropriate structural drying techniques other than extraction. We applied one application of Endurance and found it to prevent the malodor that usually accompanies this situation. We will continue to use this product to counteract malodors during our structural drying process. This product will be used also as a mold preventative during these processes. Thank you again. Andrew Reid, Operations Manager, New Age Restoration & Coatings Inc.
On behalf of the Culver City High School Athletic Department I would like to express our sincere appreciation to you for taking the time to sanitize and remove some mold from our locker rooms and coaching office. With the high incidence of MRSA and mold, it is extremely important that we become proactive for the safety of our student-athletes and coaches. Your contribution of time and materials is most appreciated. I would highly recommend that those involved in the health and well-being of athletic and public facilities consider using Endurance BioBarrier to assist in minimizing the possible spread of staph infection and the eradication of mold. Greetings six months later from the SRC! Are we ever glad that, after explaining to you the continuing battles we faced concerning mold and cleanliness in our shower and sauna areas, you offered to let us be a test site for Endurance BioBarrier. After seeing the success we initially experienced with this newly developed mold inhibiting coating, we contracted Innovative Chemical Supply to apply Endurance BioBarrier on the rest of the men’s and women’s locker rooms’ shower surfaces and ceiling during our building shut-down in December. All areas are showing no signs of mold, mildew, or fungus. This shouldn’t be surprising, as the initial controlled areas done in August are doing just that in March! That includes our sauna floor (a concrete surface under a 2” raised slatted wood platform) which in the past, before applying Endurance BioBarrier, would have had to be cleaned with a mold removal chemical, pressure washed, and sanitized at least twice by now. In sharing the news about Endurance BioBarrier with other University colleagues I thought it would only have true appeal to the building service/custodial sector. After more research, and finding the product’s equal effectiveness as an OEM ingredient, I believe it should also pique the interest of our facility and design and construction people too. All of this is why I am looking forward to partnering in an educational seminar about, not only the testing done at the SRC, but more importantly the results and product evolution of Endurance BioBarrier with you at our annual GAPPA conference this Memorial Day weekend. Thanks again for letting the SRC at Georgia State be your initial test site in facility maintenance. Just a quick note to thank you for introducing me to Endurance BioBarrier. I was called out to a client’s rental property to fix a leaky roof that had been actively leaking on and off for years. The owner had an environmental company come out to confirm his suspicions (I have attached the report). Upon my first inspection, I was able to see visible mold in several areas throughout the home. I repaired the roof to fix the problem, and then I went to work treating the mold issue. I couldn’t believe how easy it was to take care of the problem. I drilled small holes in the wall in any location where there were water pipes or where water had leaked into the house. I used a Thompson spray tip with an airless sprayer to put the EBB into the walls. A few days later, I brought in a second environmental company to test the air quality inside the building. According to the report (also attached), the air inside the building is supposed to have the same concentrations of spores etc as the outdoor air. The testing came back to show spore concentrations of up to 10x LOWER than that of the outdoor air. I was excited about the results. My client was thrilled because he was able to provide his tenants with peace of mind. I will be using EBB and recommending it to all my clients as a proactive measure. Thanks again. We have tested 100 gallons of Endurance Bio-Barrier on a shipment of lumber to the Caribbean. We have found the product to be extremely effective in protecting the wood against mold, and sap stain as there were no visible signs at the port upon arrival. The product worked much better than the current Mycostat product and had no corrosive effect on our equipment. Application is easy and clean up is simple, just a water rinse. We will be in touch for pricing, quantities and delivery arrangements for more EBB. Thanks! I would like to take this opportunity to comment on a mold remediation project that we recently completed. We were called out to do an assessment on a 16 unit building in the Los Angeles area. After obtaining a full environmental report, it was noted that each unit had significant amounts of mold and decay. In my 36 years in the construction business, I have never witnessed such a significant amount of mold and associated damage. Our remediation team went right to work. In the past I have used several types of biocides, cleaners, and associated mold removal products. But this time we started with the Endurance BioBarrier Cleaner – Prep. Then we used the Endurance Bio Barrier treatment. The EBB Cleaner prep is one of the best and most environmentally safe products I have ever used. After applying the final treatment of EBB, we were able to reenter the premises within 1 hour. With products that I have used in the past, we would have had to wait a minimum of 8 hours or more to reenter due to the harsh chemical compounds in the treatment materials. After all 16 units were treated with the complete EBB system, the environmental company retested the entire building. All test samples came back negative for mold, and the building was cleared. We have subsequently rechecked the building, and there has been no new evidence of mold regrowth. Not only am I pleased and impressed with the performance of this product, but knowing that it is totally environmentally safe and non-toxic gives me peace of mind. I’m pleased to write a short a note on a recent application of your Endurance BioBarrier products. Our client who operates apartments had a problem with molds growing on the underside of their curtains. They’ve fixed whatever humidity and water-related issues they can find, but the molds remained. They also tried cleaning the molds away with various chemicals, but the molds returned shortly. Regular laundering did not help either. When we did a trial cleaning with Endurance BioBarrier Mold and Grime Cleaner Prep and then sprayed with the Mold Prevention Spray, the client noticed immediately how quick and simple it was to apply the products and how the Cleaner Prep removed the molds easily. When the cleaned area remained free of molds after a month, they were convinced they have found the right products. They have since started applying both products for all their affected curtains. As an applicator, it helped greatly that Endurance BioBarrier products were easy to apply, non-toxic and delivered consistent, visible results. Your products worked well both indoors and outdoors, and on porous and non-porous surfaces. This has opened up many business opportunities for us. We may have finally made a breakthrough with our yacht decking client. They had expressed interest in a mold and mildew eliminator product for teak decking. I sent them a couple of gallons of EBB to test on a yacht called “Eclipse” that had a serious mold issue on the thousands of square feet of teak. They had applied the product sometime back in July and the yacht has been in continuous service since. NO BLACK MOLD! They previously had been experiencing reoccurrence of mold in 10-15 days. They have only applied the product once and have had many cleanings with my purple soap, but still no mold after three months! They are so impressed with the EBB that they want to take the product into their line and distribute it globally as part of their teak care line. First of all it came on time, it was packaged very well and easy to open, the two products work well together, one removed the mold all together and the other has set up a barrier to prevent mold. So far no mold has yet to appear. I highly recommend this product and would recommend it to my family. A high 5 stars.